There are many sacred texts in the world: the Bhagavad Gita, Genesis and Exodus, The Gospel According to John, the Upanishads. In the secular realm we might nod to the Constitution, essays of Montaigne, Shakespeare’s King Lear. Bach’s Cantatas outwardly claim their sacred nature, while for me nothing makes a walk more holy than listening to the Goldberg Variations. When I attended a Nick Cave concert in Dallas last year, it became nothing less than a religious experience–a sacred bond between performer and audience. 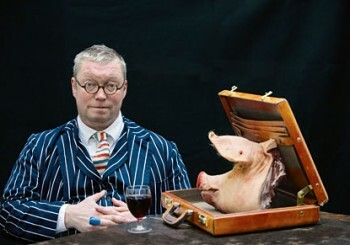 Here’s another example of the numinous–Fergus Henderson’s Nose To Tail Eating. Chef and Co-Founder of St. John Restaurant in London, just around the corner from the famous Smithfield Meat Market established in 1860, Henderson has become recognized as the guru of whole animal eating. I discovered St. John and Fergus Henderson through the words of Anthony Bourdain in A Cook’s Tour. 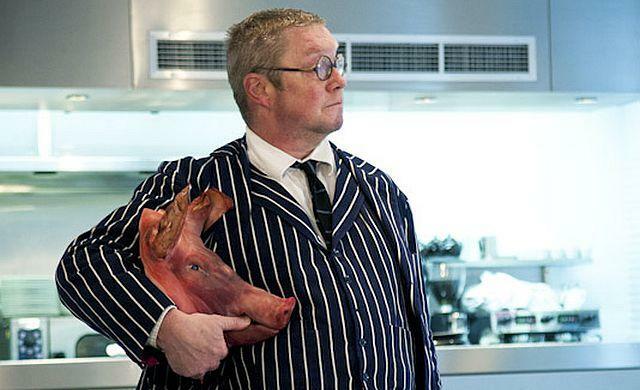 Here is Fergus Henderson in his own words in The Observer April 26, 2014 on his nose-to-tail philosophy. As Glenn Miller tirelessly sought his new sound, my search has always been for a musk; the musk of a good time, which I first encountered as a child emerging in the morning to find the remains of my parents’ entertaining the night before: a table littered with half-drunk glasses of wine, candle wax and the ruins of a monumental crème caramel all swathed in the intoxicating fog of spent cigars. My mother was a great cook, my father was a great eater, and these were the carefree times of the late 1960s and early 70s when you went to bed without tidying up. There are seminal moments which shape our lives and change our outlook permanently. This one in particular forever clarified the direction of my life. The nose-to-tail philosophy, which has been so heartily adopted over the past few years, has not been a conscious effort of education, it is for me a byproduct of this search for pleasure. Eating well is a pleasure, and it would be weird not to eat well within nature’s restrictions: short, rigorous British seasons administering good things from the earth, air and sea, and flesh beyond a fillet. This is common sense. My intention was never to cry “Woo hoo! Blood and guts!”, it was merely to celebrate the wonderful textures and flavours of insides and extremities, because that’s what I like to eat. Nature writes our menu and we should listen. A fillet is all very well, but look beyond. There are shanks, feet, glands … things to enjoy slow and unctuous, or quick and tender … tripe to soothe, stroke and uplift. It is beyond me why these things fell from fashion in our isles. Was it the industrial revolution and the consequent loss of regional foods? Was it wartime? Though the food of France and Italy was undampened. This sense of place is vital. I believe Elizabeth David has a lot to answer for. A recipe for tomato salad is all very well, but tomatoes out of season or place are dull and senseless, just as the bottle of local rosé brought home from sunnier climes turns out to be more vinegar than wine. There is a joy in origin. We need an approach which is appropriate and sensitive to those glorious restrictions, not one that circumvents them with individually wrapped aubergines. Nose-to-Tail Eating includes recipes for stocks, soups, salads, lamb’s brains, meat, birds and game, fish and shellfish, vegetables, sauces, pickles, puddings and bread. Use everything, throw away nothing. The lesser parts are as noble as the noble parts. Let’s begin. 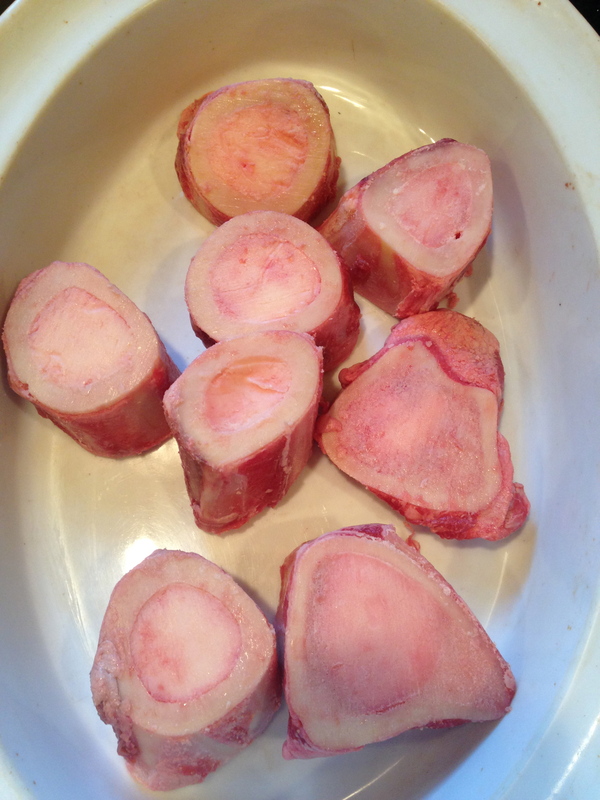 First, I ordered beef bones from Revival Market. I had originally gone into Whole Foods expecting to be able to purchase a bag, and to my surprise they were clean out. 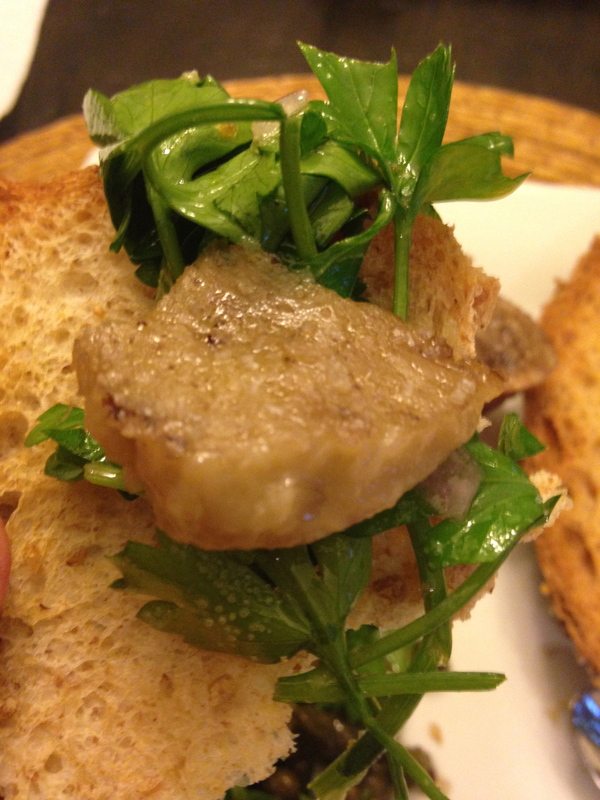 Then I went to Revival and they had none–the richness of bone marrow no longer a secret. Never mind, I ordered, waited a few days, and then “boom” I received the call, picked up the brown bag, and trotted back home to begin cooking. The oven has been set to three-hundred and fifty degrees, so in those beautiful bones go. 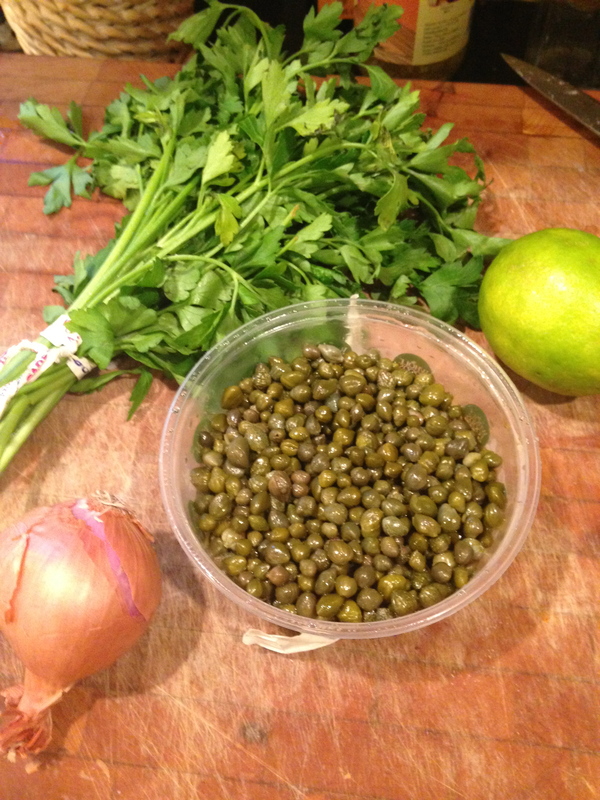 On the cutting board I have parsley, shallots, capers and a lime. I’ve replaced the lemon in the recipe with a lime because we’ve received many this week through Greenling. 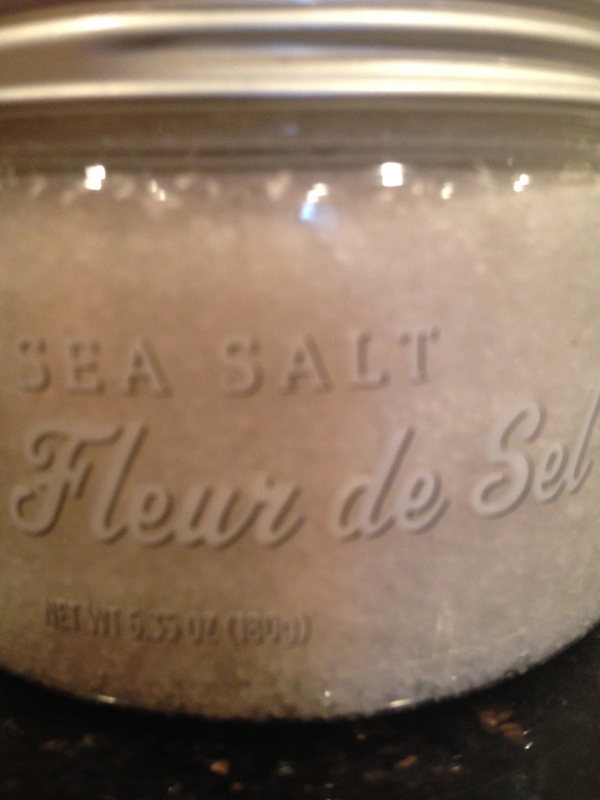 Ah yes, fleur de sel for the marrow. The roasting continues, let’s work on the salad. 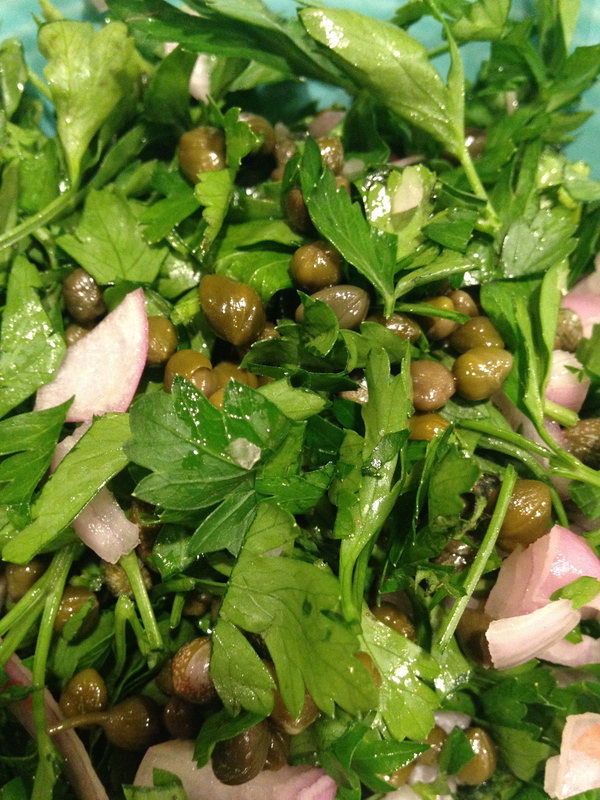 Henderson writes, Meanwhile, lightly chop your parsley, just enough to discipline it, mix it with shallots and capers, and at the last moment dress. 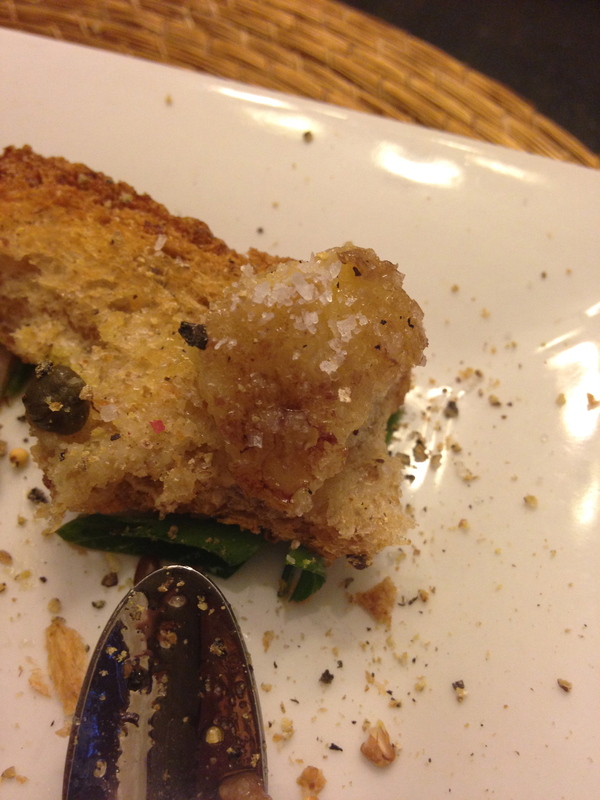 (39) The dressing includes juice of one lime, extra-virgin olive oil, a pinch of sea salt and pepper. Still roasting, how about a little more music? Duke Ellington, Take the A Train. A half hour has gone by and I’m ready to pull the bones. Ah, they look nice. For the last ten minutes of the roasting, I popped in an Artisanal Nine Grain bread from Slow Dough to make toast. It’s time to assemble. Oh, my. 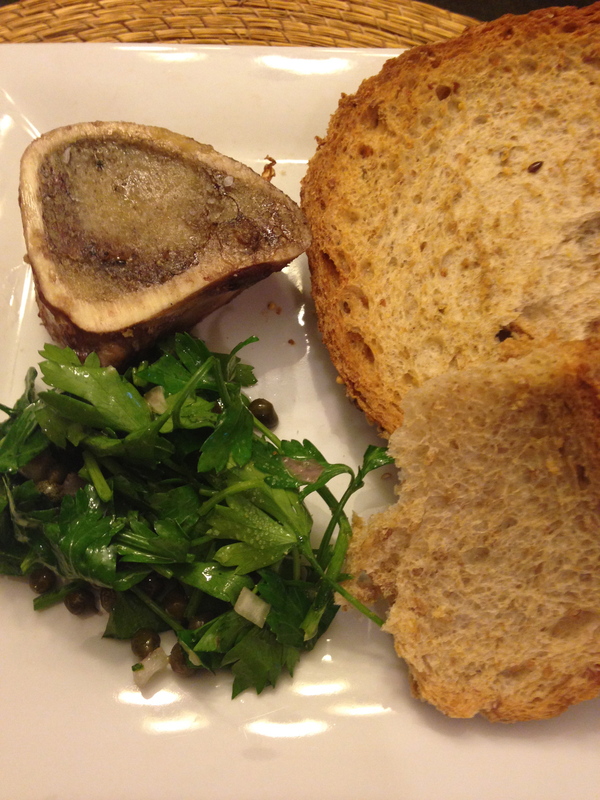 White plates, dark wood table and bone marrow with greens. Prepare for plating. How do you eat this? 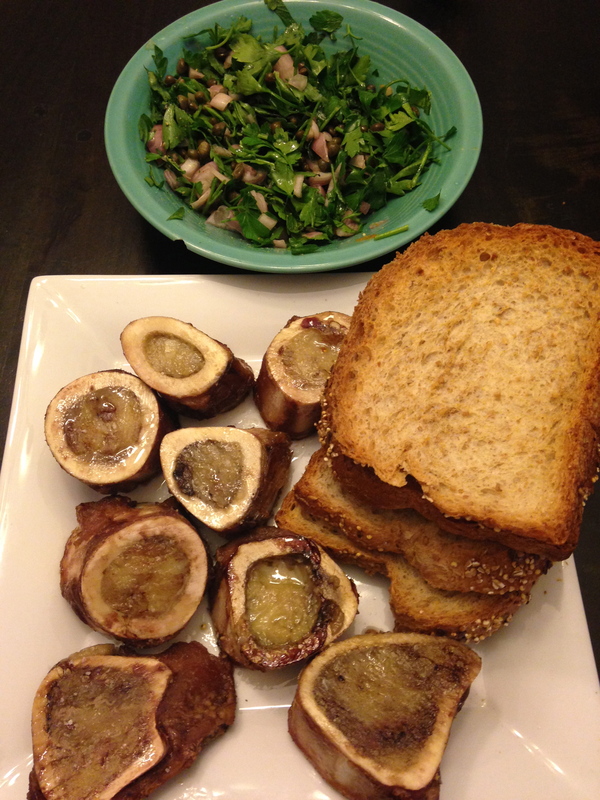 Well scoop out some marrow with a small spoon or knife, place parsley salad on a piece of bread and chew. Ah, the glories of the mouth. A buttery, protein-rich, jammy, meaty fattiness. One more bite.